Adnan Massa’ad worked as a construction contractor for 20 years, but then he realized that this is not his passion, so he abandoned the construction life and started working his land. 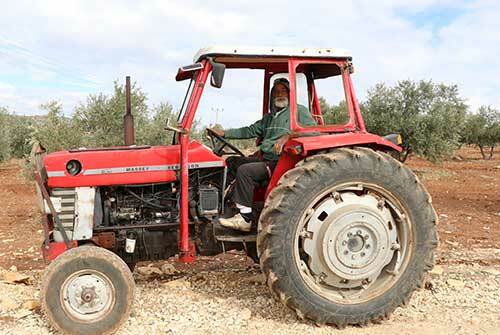 In few years he doubled the number of olive trees that he owns, and recently he’s started preparing to plant a new piece of land that he owns, which will double his trees one more time. Adnan, 60 years old and still planting new olive trees every season, and he explains that laughing, "There's a well known story about how people used to say that the younger generations eat from what older ones planted, it's well known for its title - They plant we eat, we plant they eat. Nowadays, with the introduction of new technologies and farming practices, and a lot of hard work and commitment, we eat from what we plant". Adnan, like others from the Canaan family farmers, implement the latest farming practices that help them maximize yield while meeting organic and fair trade beat requirements. Adnan is proud of his recently planted trees, "I planted those new 300 trees three years ago, this year will be the first harvest for these young trees, small amount, but still, it's a beginning".